Smoke & Mirrors' menu features upscale pub fare ideal for pairing with beer and sharing with friends. At a glance, the concept is simple: meat and beer. The brief tagline succinctly summarizes Smoke & Mirrors Saloon, the latest project from Spokane restaurateurs Kate and chef Jeremy Hansen. 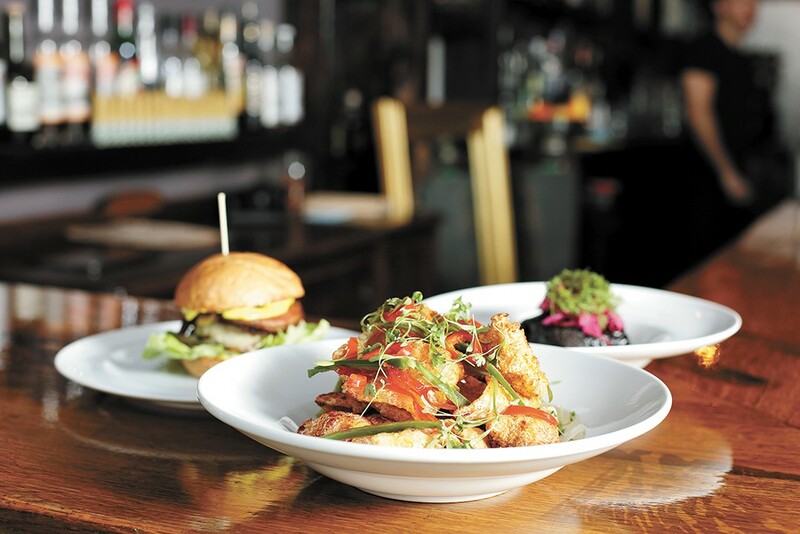 Though the upscale pub replaces Santé Restaurant & Charcuterie, the couple's esteemed 10-year-old flagship eatery inside the historic Liberty Building, careful attention to ingredient selection, preparation and presentation remains, as do a few faded figments of Santé's past. The Hansens announced Santé's closure late last year, citing a more competitive regional restaurant economy than when they opened and their desire to try something new. On the new Smoke & Mirrors Saloon menu, the Santé meat board ($20) of house-made charcuterie continues to showcase chef Hansen's practice of nose-to-tail butchery for his entire restaurant group, which includes Inland Pacific Kitchen, Hogwash Whiskey Den, Biscuit Wizard and Common Crumb Artisan Bakery. "I wanted to make it more approachable but with less ingredients, more for a shared atmosphere but also to eat with beer; more beer-forward food," Hansen explains. "On top of that, I wanted to focus on doing things well. ... It's easier food to create, but we're focused on keeping it high quality and fresh." Each of Smoke & Mirrors' three menus — lunch, dinner and weekend brunch — tally just under 20 items each. Many of the dishes overlap on all three, like the Saloon burger ($18) and a rotating burger of the week ($15). Lunch and brunch offer more sandwiches, and a few dinner entrees veer toward finer dining presentation and prices, like the duck confit with pork and beans ($23) and a steak with roasted veggies ($24). The majority of dishes on Smoke & Mirrors' opening menu are ideal for sharing, like the three sausage plate ($17) served with a variety of house-made mustards for dipping. During opening week, the trio included Irish pork sausage, pork kielbasa and spicy beef chorizo with traditional, stone ground, honey and blueberry mustards. "Those will be changing all the time. All of our sausage now is made in 100-pound batches, so when we get through that, we'll make something else — chicken and different styles and flavors," Hansen says. The salmon rillettes with toast ($10), and the smoked huckleberry lox ($13) are also well-suited for sharing. Perhaps the best value on Smoke & Mirrors' menu, however, are its meatballs; 4 ounces each at $4 apiece and served with red sauce and two pieces of bread — it could easily serve as an entree. Smoke & Mirrors' menus were a collaborative effort by Hansen and his company's chef de cuisine, CJ Callahan. The craft cocktail selection was created by the restaurant group's bar manager Simon Moorby, who may also be spotted behind the bar a few nights a week in addition to his role overseeing Hogwash Whiskey Den. In addition to beer on the bar's five taps and a small wine selection, Smoke & Mirrors' cocktail list predominantly features familiar classics ($9-$13) like the Corpse Reviver No. 2, Last Word, Dark and Stormy, Moscow Mule and others. Five seasonal house cocktails ($12) by Moorby and his team are each built around a focal spirit — gin, bourbon, vodka, Scotch and rum. The break between Santé's last day on March 17 and Smoke & Mirrors' April 1 opening was fast — only two weeks. In that time, the Hansens and their staff updated the space with new paint, flooring and the installation of old-timey chandeliers and light fixtures evoking a Western saloon feel. Gold-framed mirrors adorn the walls. Several pieces from Santé's dining room were also repurposed into the new space, including its dining chairs. The most notable visual change comes from the addition of a massive custom-built bar combining an antique bar top with a back bar built from old salvaged lumber. Hansen says the bar top is estimated to be about 85 years old and was pulled from a downtown Spokane building that was torn down more than four decades ago. To bring the saloon's old Western aesthetic full-circle, bluegrass music plays one evening from behind the bar. Customers who've noticed the disappearance of Santé's former outdoor patio along Main Avenue needn't mourn its disappearance, Hansen says, as the patio seating is soon returning for spring. The connected Butcher Bar is also reopening in the coming weeks, offering the restaurant's full food menu along with specialty cocktails in a bartender's-choice format and pre-mixed cocktails on draft. "A two-week turnaround getting this open was pretty crazy for us to do," Hansen notes. "We had to pick and choose our battles to make sure we got it up and going." The original print version of this article was headlined "Barring Illusions"